Today, more and more women are looking to invest in quality mechanical watches. While watchmaking has typically been focused on men, there are many fine examples of women’s timepieces that are worth the investment. Rolex has produced several lines of ladies watches, with the ladies Rolex Pearlmaster line being one of their most popular. Known as the “pearl of the Oyster collection,” this richly embellished interpretation of the classic Lady Date-Just is a must have for any discerning female collector. It is made of only the highest quality materials including high-grade 18k yellow, white and Everose gold from the Rolex foundry. Each timepiece is also set with high quality diamonds or other gems, from the bezel to the hour markers. With such luxurious features, this wristwatch will quickly become the crown jewel in most collections. The rounded bracelet and 29 mm case is one of the most recognizable characteristic of this family of watches. The size of the watch is slightly larger than the traditional models, giving it a noble and distinguished look. This special watch also features the famous Rolex date window and Cyclops magnifying lens. The only feature that rivals this watch’s elegance is its performance. Featuring the caliber 2235 self-winding mechanical movement that was entirely developed and manufactured by Rolex, this watch is known for its reliability and accuracy. Like all Rolex Perpetual movements, the movement is a certified Swiss chronometer, a designation that is only reserved for the highest-precision watches. Since the Date-Just was introduce in 1945 it has captivated buyers and has quickly risen to become one of the most popular Rolex models available. It is admired for its classic design and has easily become an iconic symbol of luxury, class and style. 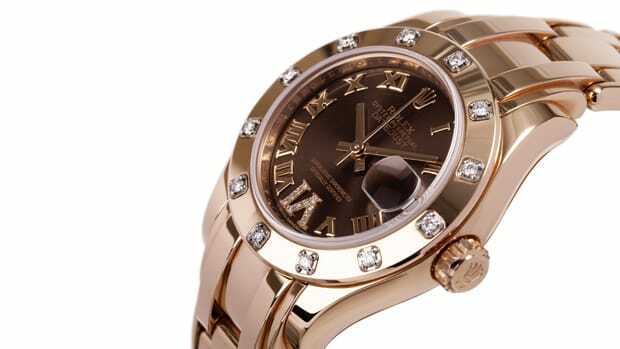 If you are a woman looking for the perfect timepiece to adorn your wrist and turn heads this will be a top contender.